"What's for breakfast?" is something I don't hear in my apartment very often, since there is rarely anybody there to ask. But if there was, the answer would definitely be "perfectly round fried eggs", thanks to the non-stick egg rings I have been evaluating. All week I have been practicing making fried eggs with these little silicon circles with varying degrees of success. 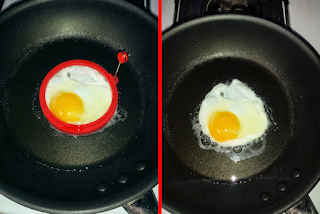 The concept is as simple as frying an egg, but with an extra step. 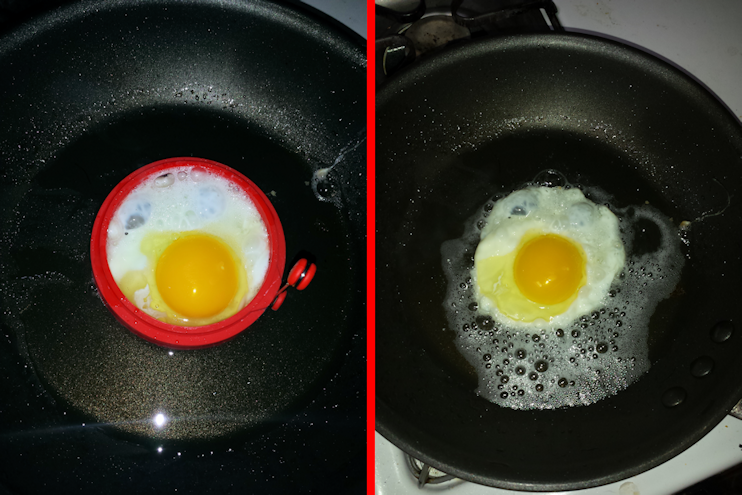 Just place the egg ring into the pan and break the egg so that the contents land within the circle. The egg ring keeps the egg bound within it's silicon wall leaving you with a perfectly round fried egg. Ah if it were only that easy. Lift the egg wall too soon and liquid egg escapes and then congeals into fingers of white as it cooks. Wait too long and your egg has adhered to the pan and is going through ever darkening shades of brown. I have found the best result come from having a pan which is at just the right temperature, adding the egg at just the right time, and removing the egg ring at the perfect moment, then flipping the egg to make it over easy. You will have to experiment yourself since there are too many variables and differences between my kitchen and yours. 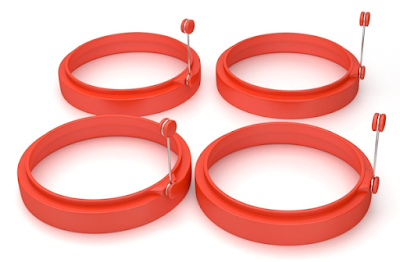 An early adventure with the egg rings caused great frustration for me as the little antennae, which allows you to lift off the ring, slipped from it's upright position and rested in hot oil in the pan. The struggle to raise it again to remove the ring caused me to fry my knuckle and end up with an egg suffering from blackened bottom. I am not going to give up on finding the perfect formula to make an egg as round as the ones you get in a McMuffin, but I have banished these egg rings to the kitchen drawer which contains the SlapChop, the Twirling Spaghetti Fork, and the Spiralizer; all of which do come back out again periodically, so I will get to use the egg rings again, probably to make perfectly round pancakes, since batter is a little better behaved than egg white. Overall, this is would be a good product if you have the patience and skill to use it to it's fullest potential. Personally, I am going back to having slightly less round eggs with one less thing to wash after breakfast.